When she entered the inn, framed momentarily in the doorway by the fading sunset, the four patrons--and the innkeeper--looked up. Normally, few passing by her on a road would spare a second glance. She did stand out; wolves were an uncommon race, and she stood tall for a woman. But her form was more lanky than lissome, and both her robe and gaze were plain and well-worn. She moved with neither outsized forcefulness nor undue timidity, but merely simple efficiency. The innkeeper, a stout grey cat whose spryness belied the wrinkles about his eyes, stepped around the cypress countertop and bowed deeply. "A traveller? A room for the night, then?" he said, hopeful grin wide enough to expose a missing tooth. "More than one night, I hope," she said, dropping her heavy satchel and matching his bow with hers. "I am looking for work." "Ah!" He raised his brows. "This is not a good town for work. Not this season." He motioned her toward the bar, pulling out a modest wooden stool for her. "The fields have been picked, and there aren't many shops left open. Other than mine, of course--few travelers, but everyone always wants to drink." He laughed, producing a bottle of sake from under the bar, presenting it to her with a practiced flourish. She laughed. "Thank you." As he poured a cup, she leaned forward, brushing a lock of fine sable hair away from her golden eyes. "Surely there's some work here. This town looks like it's at least several hundred people." "Was," he corrected, setting the cup before her. The wolf nodded in thanks and sipped at the rice wine. Her nose had told her when he'd opened the bottle that the sake wasn't very good, and a taste confirmed that. But it was drinkable. "What happened?" He shrugged. "They have gone to the capital city, perhaps. As long as they are paying for Lord Tama's glorious cultural center they might as well benefit from it, yes?" He laughed. "He's the area's governor? High taxes, then?" "Double this year from the last, and that double what it was the year before." The cat shrugged, then glanced toward one occupied table. "But enough of that." He grunted thoughtfully, and topped off her sake cup as he continued speaking. "You are looking for any odd job?" The wolf looked in the direction of his glance to a rat and a fox, neither of whom appeared to be listening. She turned back to the innkeeper. "I have money for room and food here. I need room and food in the next town." "So you travel alone, from town to town? That's unusual for women." "So I'm told," she said with a soft smile. "Hmm." He tapped his fingers on the bar. "Do you weave?" He nodded. "In the morning, then, I'll take you to Leiko. One of her girls is gone, and Tama has a large order in, I hear. They could use help. She has been pestering me to lend her my grand-daughter." He shook his head, and topped off her sake again. "What's your name?" "Nice to meet you, wandering wolf Hisae." He laughed. "I'm Kisho. Finish that and I'll show you to your room, then get you some dinner." At sunrise, Kisho led Hisae to the weaver's. He had not exaggerated; the storefront was one of the only open businesses. As they walked past rows of low angled roofs, he explained it had been owned by Leiko's husband, but she'd done all the work from directing the looms to the accounting. When he'd recently died, she took over the whole operation. Leiko was an older fox woman, not unattractive but with a face too severe to live up the race's reputation for ethereal beauty. As Kisho made introductions, she appraised Hisae with clear suspicion. "And how much experience with a loom have you had, Hisae? I've heard of no itinerant weavers before." She left the implication that a good weaver would have a permanent job unspoken. "Enough to do simple work and follow directions well," the wolf replied. She'd changed into nicer clothes than yesterday, but found herself wishing for just one of the fine kimonos she'd possessed in an earlier time. "We'll see," she said skeptically. "I'll let you know how she works out, Kisho-san." As the innkeeper bowed, he flashed Hisae an apologetic grin. Leiko led her past sliding paper screens into the back room. Most of the floor was taken up by five looms, the rest by yards of fabric and great spools of thread. Three girls sat at their stations, working furiously. "Lord Tama's new --what is it this time?--exhibition gallery, I believe, is something he wants completed in less than a month, and a dozen hangings must be on the wall by then. That won't be what you'll be working on, of course; we have other jobs that are running late, simple mats and clothing. It's going to be your job to make them less late." Hisae nodded. "Very well, Leiko-san." Despite Leiko's continued glare, the wolf settled into a rhythm at the loom. Truthfully, it had been years since she'd used one, and she knew she'd be the slowest in the room--but she made no mistakes, even subtle ones, in her weaving. Leiko had reason to snap at each of the others through the morning, forcing them to pause and backtrack, muttering about how she hoped no one at Tama's palace knew any better than the girls did about what constituted high quality work. But while she grumbled at Hisae for her lack of speed at first, that soon stopped. It was well after lunch--provided by Leiko, only plain rice with a single chicken wing--when the rat she had seen the night before swaggered into the room. Now he wore rich garments, tailored to suggest armor without being as restrictive--or protective. A samurai's swords hung at his side. One would think he was striding onto the battlefield, rather than into a room full of women with looms. "Lord Rafu wishes to know if the banners are ready," he announced, without looking at Leiko. The fox's ears had flattened the moment the rat entered. "He will know as soon as they are, sir." Picking up the edge of one bolt of fabric still on a loom, he studied it, then tugged it up closer to his face. The loom clattered angrily, the cloth unravelling at the end. The weaver bit her lip. "What?" the rat said, dropping the cloth and glaring at her. "You can fix that, or start over." She nodded hurriedly, gathering the fabric back up. Hisae crossed her arms. The motion drew the rat's eye, and he turned to examine her work. "You're the girl who came to the inn last night." He snorted. "You are finished with this cloth?" he said, grabbing a neatly folded pile by her loom's side. "This can't be for the daimyo. A kimono?" He grunted, and moved away, carrying it. "It is for a customer," she said, voice polite. "Please set it back down." The rat stopped and turned to look at the wolf. Leiko went pale under her fur. "How do you know it's not for me, girl?" "You wouldn't have asked about it the way you did." "It's for me now." He leaned forward over her loom, showing his teeth. "Do you mind?" Hisae met his eyes steadily. "Does Lord Tama mind that he employs a thief?" The rat stiffened, and his hand went to the hilt of his sword. He held there a full second, then abruptly grabbed the loom and slammed it against the wolf with an angry yell. Hisae toppled to the floor, the loom crashing on top of her. As she pushed it off, he kicked her in the stomach, knocking the breath out of her. "Keep traveling, wolf girl," he said, clenching his fists. "Or someone will cut that tongue out of your mouth." Wheezing, she pulled herself out from under the loom, unable to say anything before the rat stalked out, carrying the kimono cloth. "Ohhh," Leiko fretted, righting the loom. "This is damaged. Damaged!" She thumped the loom's side, pushing one of the arms back into place. "Do you expect Rafu and his men to pay for it?" "I'll pay," Hisae said tightly, forcing herself to unclench her jaws and fists. "How? More weaving, until another thug or Rafu himself does more than knock the wind from you? No. Just get out," Leiko said with an exasperated sigh. "Get out, Hisae, for your own good." "You hold a knife well," Kisho said, watching Hisae chop a cabbage. His grand- daughter, Kunko, was also in the kitchen, although she spent more time staring at the wolf wide-eyed than cleaning. Truly, Kisho didn't need more help, but he had offered this in exchange for room and board, so she could at least leave town no poorer than when she arrived. The cat nodded. "Yes, that is clear." He looked at her so searchingly that she stopped, turning to meet his gaze. After a moment he laughed, turning back to his own chore. "It is a shame your tongue is as sharp as that blade, Hisae-san." Her ears folded back. "That rat is a thug." "That rat," he grunted, "is a samurai, Rafu's second-in-command." She scowled, and finished chopping in a frenzy of flashing steel. Perhaps everyone always wanted to drink, but it seemed few people wanted lunch. She helped the innkeeper cook, too, trying to follow his exhortations of "More soy! More ginger! You season like a timid old man!" It seemed like much too much ginger, but his food--and hers, with his guidance--was among the best she'd had outside the royal court. It was late afternoon when Kunko called for Kisho to come to the dining room, saying that "some men" had come to see him. When Hisae heard his voice raised a few minutes later, though, she hurried out of the kitchen herself, knife in hand. The rat stood there, now with the burly fox she'd first seen him with. The fox's arm wrapped around Kunko; the girl's ears were folded back flat, tail curled about her leg. Hisae sucked in her breath sharply, fist clenching. "You again!" the rat exclaimed when he saw Hisae. "First an incompetent weaver, now an incompetent cook? Go back to your chopping and leave us to our dealings." Kisho growled. "I cannot pay you that much even if I would." "Then your grand-daughter will be in service to Ryu for the time it takes you to raise that money." "From thievery to kidnapping?" Hisae said, voice low, trembling with restrained anger. "And threatening children?" The rat growled. "I have had quite enough of you, wolf maid. If you speak again, someone will be hurt." He glanced at Kunko; Ryu grinned, drawing a dagger. The cat whimpered, but the fox held her fast. Kisho spoke angrily, but his voice shook. "Let her go and I will get your money." "I've already told you how this will work, Kisho-san." "I will not accept that!" The rat sneered. "It wasn't an offer. You're willing to risk your grand- daughter? You've already lost her ear." He nodded curtly to Ryu. The fox grabbed the girl's left ear, pulled it up hard, and his blade flashed. Kunko screamed, drowning out Kisho's cry as blood spattered across her. And she kept screaming, along with the fox. The blood wasn't hers. Her captor had a kitchen knife where his right eye had been, buried to the hilt. His own knife fell out of his hand, and he dropped to the ground. Kunko fled, wailing at the top of her lungs. 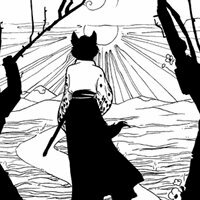 Both Kisho and the rat samurai stared at Hisae. "I didn't speak," she said. The rat's ears went flat, and he drew his katana, yelling and charging toward her. She leapt out of the way of his strikes, once, twice, a third time, forcing him to spin around as he slashed repeatedly where the wolf had been a moment before. After the third miss, she dove at his legs, and he toppled, his sword underneath him. She spun around and shoved her foot on his back, hard, knocking the breath out of him this time. "Samurai," she growled, "do not bully children." She stomped her foot down on him again, hard enough to make him grunt in pain. "Or kitchen maids." By the time he got to his feet, Hisae had pulled the knife out of his dead companion, glaring at him from a fighting stance. The rat backed toward the door. "I'll be back for Kisho's girl in the morning," he spat. "And the money. With Rafu and all my remaining men. Wolf- girl, if you have any wisdom at all, you'll be far away from town, praying my men don't see where you're hiding." Kisho watched him go. "Oh, Hisae-chan," he murmured. "What have you started?" The wolf folded her ears back, looking down at the floor. He touched her shoulder. "You did the right thing. You saved Kunko from being hurt." "Children are not to be bargained for," she whispered hoarsely, still looking down. "Rafu has wanted all my profits ever since he realized mine was the only business still successful." He laughed bitterly. "And that fox had had his eyes on my grand-daughter for at least a season." Shaking his head, he stood up. "Let's do something with this body." Hisae straightened up, and looked at him directly, one ear tilted to the side. "You are very calm about having someone killed in your inn." The cat picked up the fox's legs. "After we do something with this," he said with a wry grin, "I shall arrange to have Kunko sent to another town this evening, and you and I shall have sake. I will tell you why I am calm, and you will tell me why a warrior travels unarmed across the farmlands." Instead of pouring sake at the bar, Kisho led Hisae to the back, past the kitchen, to his modest living space. He motioned for her to sit at his small table, and got down two glasses and a bottle more ornately decorated than any she'd seen in years. "I don't bring this sake out to the front, because Rafu and his men don't deserve it," he explained. "But it needs to be drunk." She sniffed at it and took a sip, and breathed deeply. "This is the best I have had in... some time," she said with a grateful smile. "Since you were last back in Edo?" The cat chuckled, sipping from his own glass. "Your accent is mostly gone, Hisae-san, but I can catch it, sometimes. You will need to live in a small town for a decade or two more for it to fade." Smiling more self-consciously, the wolf just nodded once, and drank in silence. Kisho leaned forward. "You may want to act as if that were a lucky throw, but it most certainly was not. I owe you my grand-daughter's freedom, and possibly her life, samurai." She set down her glass, gaze growing distant. "Some years ago, there was a warrior woman in Edo named Hisae. Some would say very good, some would say just a curiosity. It is said now she is dead, by treachery or stealth or by her own hand." She clasped her hands in her lap, closing her eyes. "I am... not that woman, Kisho-san. But sometimes I am haunted by her ghost." "There is no shame in being a ronin," he said at length. "A ronin has lost his master," she said softly. "That is not the same as turning one's back on him." Kisho sighed heavily and fell silent, sipping his own sake. After some minutes had passed, he spoke again. "You are too young to remember the time before the Shogunate, aren't you?" She nodded. "That is true." "Many samurai found themselves ronin then. Some found service elsewhere; some opened schools in various martial arts. Too many became brigands. And some even became farmers." He refilled her sake. "Or innkeepers." Hisae refocused sharply on her host. Catching her expression, he laughed, leaning back. "Not everyone has always been the way they are now, hmm?" "No," she said, smiling. "They have not." "Some people, of course. Rafu is a brigand at heart, which is why his men are as well." He rose to his feet, then waved at her when she started to rise, too. "No, keep sitting." "I fear what I did tonight will bring Rafu's anger down on you and your grand- daughter, Kisho." "Oh, it shall, and it shall be worse for you if you don't follow his thug's advice to leave during the dead of night," he replied with a wry smile. The innkeeper headed toward the other side of the room, crouching in front of a chest there. As he worked the lock, he kept speaking. "Hisae, I told you, the most you have changed is the timing. Perhaps it would have happened next season rather than tomorrow, but it would have happened." She nodded, closing her eyes and grunting softly. "Yet I have still caused trouble, and it seems I must compound the insult by leaving quickly." Chuckling, he looked back at her. "No matter what romance poets weave about honor and redemption, my friend, staying alive is no insult. I owe you a debt." He opened the chest, and lifted out something tied in cloth, balancing it across both palms. Rising carefully to his feet, he walked to the table and set it down between them. "I think this shall be good recompense." "Kisho-san, I appreciate everything you have done for me already, but there is no... need..." Her voice trailed off as the cat pushed the velvet fabric to the side, revealing the katana underneath. "I haven't had need for this in twenty years, and I am too old and out of practice to use it now." "But--no. It looks like a very fine blade. I cannot--" She stopped again, leaning over the sword, examining the smith's mark. Her eyes grew very wide. "This is a Masamune!" He showed a hint of a smile. "So it is." "I--" Hisae rubbed her forehead, suddenly overwhelmed with questions, but she simply said in a quavering voice, "I cannot accept this, Kisho! It is an heirloom!" The cat tilted his head. "I have no family left but my grand-daughter, Hisae, and let us be honest. If this katana stays here, it will not pass into her hands but Lord Tama's. Unless Rafu keeps it for himself. It deserves better, don't you think?" "You will dishonor me if you refuse," he said, crossing his arms, although the hint of a smile was still there. Hisae sighed, resting her hands on the edge of the table, not daring to touch the cloth that had covered the sword, let alone the blade. "If it disturbs you to take this as a gift, then take it as a temporary charge," he said. "Hold it in care for someone." "Who?" she said, looking back up at him. Kisho leaned forward, tapping the back of her hand lightly. "You may meet the other Hisae on the road in your travels," he replied. "If you do, she shall need a sword." Hisae looked around the room again, as if checking to see if she had missed anything in her packing. But she owned so little. Several changes of clothes, a netsuke of whale bone she had been given as a child, a brush. A decorative hair comb she told herself that someday she would give to her own daughter, the daughter she had never seen, if she dared return to Edo--if she had the courage refute a lie about her death she had not started, but knowingly allowed to blossom. And, now, a blade, centuries old, forged by the land's most illustrious sword- smith. She looked at it, laid out on her cot beside her, an incomparable treasure given on whim to an undeserving vagabond. Now here she was, about to slip away into the darkness like a thief; but she had done herself--and Kisho--no service today by trying to be more than that vagabond. Forcing her mind to stillness, Hisae stood, slinging the pack over a shoulder, and reached for the sword. When her hand closed around the hilt, her eyes teared. Abruptly she found herself on her knees, slumped over the mattress, sobbing. She had not cried in years--the one thing she had clung to from her former life had been stoic serenity. Now that, too, had finally shattered. After long minutes, she lifted her head, wiping her eyes. The first thing her gaze settled on was the small window, the full moon beyond it. It was a good night for traveling. The rat was true to his word; just past dawn, Rafu himself came to Kisho's inn. A great hulk of a tiger, he had little of the pomposity of his henchmen, instead oozing a quiet menace. He simply stood at the inn's entrance while his six men, including the rat, fanned out through the building. Hisae had been the only guest, and Kisho had no other staff now; the only person the men could find to haul before Lord Tama's head enforcer was the still-drowsy old innkeeper himself. "You are behind on your taxes," the tiger said calmly. Kisho grunted. One arm was being held behind his back by a wiry raccoon-dog. "I have paid everything that I have seen on an order with Lord Tama's own seal." Rafu nodded slightly to one of his men, who stepped forward and punched Kisho in the stomach. "You are behind," the tiger repeated, "on your taxes. It is my understanding that you... refused an offer for other payment yesterday." He stepped forward, leaning down toward Kisho, and bared his teeth slightly. "And you had one of my men killed." "Wasn't my idea," Kisho wheezed. Rafu stared into his eyes, then smiled thinly. "You sent the child away, didn't you? So she can't be taken. Wise, yet very stupid." He straightened up. "I'll make you another offer, Kisho, to show how generous I am. You shall give me the money I owe, plus recompense for the man your kitchen maid killed." He spat the words kitchen maid like a man eating a sour lemon. "And I'll leave you with wounds that will heal, eventually." "Told your man yesterday... don't have the money." The tiger sighed, then nodded to another of his men. That one stepped forward and whirled a bokken into Kisho's left knee. The old cat screamed, and bit back tears. "Then you will give me all of the money you do have, and give me all the money you receive until your debt is paid off. Do we understand one another?" Kisho just stared ahead dully. "I'll take that as a yes. Now--"
"No," Hisae said from the inn's entranceway. All the men turned. The rat's ears folded back. Rafu looked incredulous, then narrowed his eyes. "You must be the bold kitchen maid who caused so much trouble yesterday. Well, little wolf, I'll extend the same offer to you. What you pay, Kisho won't have to, and if you pay enough, you can walk away. Or at least crawl." He nodded to the rat this time. The rat looked back, hesitating. "She's armed," he said, pointing to the sword at her side. Rafu frowned. "Disarm her," her snapped, waving to two of his other other men, burly cats armed only with staves. They rushed forward, one raising his staff over his head, the other moving to try and grab Hisae's arms from behind. Hisae drew her sword, swinging it up with both hands in a high arc. The staff coming toward her hit the blade, jerked out of its owner's hands, flung toward the ceiling. As she brought her sword down, she whirled, the blade singing as it cut through cloth, fur and flesh as effortlessly as air. The two attackers fell to the ground before the staff did. "Fight her like she knows what she's doing," Rafu snarled at his remaining men, stalking toward Kisho. This time, bokkens were held defensively, swords were out. Hisae and her attackers looked at one another, the wolf surrounded by four men. She crouched slightly, waiting. Then the man behind her leapt forward. Hisae whirled again, and this time, she didn't stop. As she deflected one blade, two more were in motion toward her. For years, she had practiced only with a walking stick, and with a sword back in her hand--even this sword, finer than she had ever held before--she wasn't as fast as she remembered herself being. But when she had been called a samurai, she had been very fast. A fight of one great swordsman against four who are merely good becomes a cruel dance, the larger group trying to tire the one so she slows, the one making her opponents pay for even the slightest mistake. It was less than thirty seconds into the fight when the first man went down, his sword arm separated above the elbow, and another thirty past that when one of the bokken-wielders followed, his gut slashed from left shoulder to right hip. Over the next minute, each of the remaining fighters--including the rat, the best of the bunch--bore freely bleeding gashes. Hisae's strikes never left her sword caught in an opponent, and while she took glancing blows, few drew blood. Hisae didn't pause until the other men had backed away. Rafu had been left alone with Kisho; he held the old cat by the hair, a dagger at his throat. "If I kill him, it makes this show pointless, doesn't it?" the tiger growled. "Lower your sword." The wolf did so, staring at the tiger, breathing hard. "Fight me yourself, then," she spat. "Don't hide behind an old man." "Who do you serve under?" "Who did you serve under?" Rafu's voice was patient now, but the dagger hadn't left Kisho's throat. If she answered, word might well make its way back to Edo. But she knew she had already made her choice. "Lord Saburo," she said softly. "Saburo?" he said. "That's a mighty claim, little wolf. It would place you very close to the emperor himself." The tiger straightened, dropping Kisho to the ground. "I used to visit Edo, years ago. I remember a tale, the kind told in taverns by drunken men. A woman warrior who committed seppuku, shamed by betraying her lord. Do you know that tale? I've always been curious about just what she did." "It has many endings," she replied, her voice steady. "Some say her lord betrayed her." "Do they." The tiger stepped forward. "Well, kitchen maid samurai, I shall make you a much better offer than the last. Go into my service." The wolf straightened slightly, her eyes narrowing. "You're clearly a better fighter than any of my men." The rat's ears folded back, but he didn't interrupt. "After you work off the debt incurred by killing four of them--wait, the one last night makes five, yes?--five of them, I'll pay quite well." "And your claim against Kisho and his grand-daughter?" "You can choose to pay off his debt as well." "So you are offering me the choice to become a brigand." Rafu hissed. "Don't lecture me about bushido." He closed with her, looming over her slight form. "My daimyo's dream is to make his little palace town into a wonder second only to Edo, and who am I to tell him he cannot? Who are you to judge us?" He spread his arms. "This is what samurai do, little girl. Maybe in the capital city you can practice the delicate art of flower arranging, writing treatises on honor and etiquette, but in the rest of the land we do what we must to survive and do what we can to survive well." He leaned forward, glowering. "And unlike you, I still serve my lord. I'm offering you a chance to do so as well. Are you so blind as to turn that down?" Breathing out very slowly, Hisae took one step back from the tiger. "It is a generous offer, Lord Rafu." She glanced over at Kisho, who had recovered enough to look back at her steadily, without expression. Turning back to the tiger, she raised her sword. "But I must decline." His brow furrowed. Then he snarled, drawing his sword and bringing it down like a hammer in the same motion. She twisted to the side, blade humming through the air; he parried just in time, then stalked forward again, his heavier blade chopping relentlessly. Hisae abruptly found herself fighting just to deflect his blows. "You're not as good as you think you are," he snapped, jabbing his sword down and forward. She parried, but the tiger out-muscled her, his blade slashing into her leg. It was enough to make her stumble, and she scrambled back, his next strike barely missing. "I know exactly how good I am," she gasped, hoping it was true, swinging more desperately now. Even as the tiger parried her attacks, he marched her back toward the wall. When he miscalculated, though, her blade arced along his, the edge of her sword cutting into his arm before he jerked away. "Do you?" Growling in pain, he hurled his whole body forward as he swung again. She deflected his sword, but his body slammed her back against the wall. Hisae held her sword in front of her as she slid down to the floor, wheezing. "I'll mount your pretty head on my wall," he snarled, lunging with his sword. She rolled to the side, letting his force drive the point into the wall behind her as she scrambled back to her feet, raising her sword for a strike. With another growl, Rafu yanked his sword free, and slammed himself against her once more, sneering when she gasped in pain. Then his eyes widened. Hisae had moved her sword faster than he had lunged, lowering it just so. And now the tiger's own weight pulled him down along her blade. Their eyes met as he tried to push away. She could see the point of her sword coming out over his shoulder. "You may keep your head," she said softly. He opened his mouth, but only a trickle of red ran out. She squirmed to the side, letting him slide off her katana as he collapsed. Rafu's two surviving men simply stared, wide-eyed. Hisae raised her sword, blood streaming off its edge, and motioned at the rat to close with her. He squealed, and ran out of the bar as if demons were pursuing him, the other man on his heels. "For someone with nowhere to go, you are very eager to leave," Kisho said over tea. Hisae had stayed in the town another week, letting her wounds heal--none too serious, but more of them than she'd realized she'd taken--with dozens of townspeople coming by to see her. Kisho's tales of her bravery had made her a local hero. "I do have somewhere to go, Kisho-san. I must visit your Lord Tama, to start with. I do not think he knows what Rafu was doing here." "You are still an idealist," he said with a smile. "And where would you go after that?" "I don't know." She finished her tea. "But some day, I must go back to Edo." He nodded, stroking his chin. "And some day, you must come back here." "I must," she agreed, smiling. Then she leaned over the table and gave him a kiss on his cheek. "Thank you, for everything." Kisho laughed, clasping one of her hands. "You have saved my life, my grand- daughter's life, my business, and some say the town, and you are thanking me?" She glanced down at the sword at her side, and back at him, with a soft smile. He grunted, and led her to the door, moving sprightly despite a new limp. It was a clear, cool spring morning, the road and country ahead aglow with the sunrise. "So do you think you shall give the other Hisae that sword, then?" Stepping out into the light, she turned and bowed to him. "I already have." A story in the vein of classic samurai films: a wanderer in medieval Japan looking for work in a town she's come to finds the town may need a hero more than it needs a weaver, and is forced to come to terms with the past she's been avoiding. Originally written as a con book extra for Further Confusion 2008 ("The Fur East").